The view through a window can be inspiring for anybody. The light playing on tree branches and shrubbery can tickle the soul and energize imagination. It is a bit unfortunate but sunlight can also invigorate and annoy. Too much heat from incoming solar rays can turn a work area into an indoor desert and the glare can be downright aggravating. Companies try to reduce the discomfort with blinds and curtains but these can produce sizable maintenance costs. There is a ray of good news to brighten things up a little bit. Technology in glass production is allowing more companies and consumers as well to regulate the heat coming in from the sun, reducing the amount and increasing it when needed. It’s called smart glass. This viewing medium is both complex and amazingly simple. One fundamental component of the smart glass window is photochromic technology in which material darkens in response to sunlight. This is comparable to making the glass in the windows react to the sun’s radiation like a pair of totally cool sunglasses. Windows that darken in reaction to the sun have been previously criticized for not being completely efficient and having no adequate means of control. 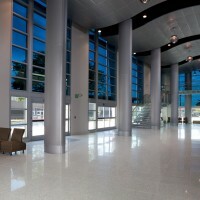 However, recent improvements have created smart glass that is also electrochromic. Because of this it is possible to program the windows to better respond to the angle of the sun, allowing darker shades only when deemed necessary. Other smart glass technology, Suspended Particle Devices (SPDs) takes the light control of smart glass to even greater levels of sophistication. Research Frontiers uses millions light absorbing black particles (theSPDs), floating in a liquid between two glass panels, and managed by an electric control device to block or admit solar rays. The result is greater control over an amazing agent for solar heating. Installation is probably not a DIY project. The intricacy of the glass panels and the need to set up the controls properly make it feasible to have a professional do the work. Anyone who has a commitment to greener work and home environments will find smart glass to be absolutely fascinating. Smart glass can definitely block out excessive amounts of UV radiation and reduce glare. This also has a positive effect on both heating and air-conditioning cost because of the ability to regulate how much sunlight is able to come in. As with everything else there is a cost to the purchase and installation, and a building owner has to remember that. Yet, over the life of the glass itself, any the savings on energy and maintenance will more than compensate for the upfront costs. Also, from a green environment point of view smart glass is an excellent way to reduce carbon emissions and leave a much smaller carbon footprint behind. Some homeowners or companies may be a little bit hesitant about making a full scale commitment to have solar energy heat and cool space. That’s understandable given upfront costs but installing smart glass may be an excellent first step in converting to solar energy. This product has been proven to save energy costs and be environmentally friendly. Best of all, it lets people view the outdoors free from obnoxious glare or uncomfortable heat.